Do you want to raise your profile online, generate more leads and improve Web sales? We can analyze your current web positioning and then propose to you a strategy based on your corporate objectives. 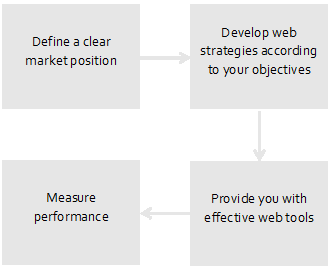 Development of a Web strategy is generally done after or in conjunction with positioning in the Market Planning process. The Web strategy created will also propose one or more Web tools to be used in accordance with your goals.